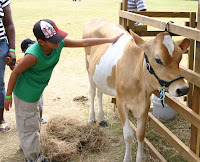 Last Weekend, Agrofest, an annual agricultural exhibition by the Barbados Agricultural Society was held at the Queen's Park, Bridgetown. There were lots of produce on sale and display. It was like a large open air market, lots to buy, lots to see and lots to learn. Click here for more Agrofest pictures or on the Agrofest album on the right hand side of the blog. I could not resist taking this photograph. This is the kind of can that women carried on their heads long ago as they walked about selling mauby. When they had a customer, they would skilfully fill a cup without looking up and without spillage!